The fifth storey is going on the RACV golf club development. 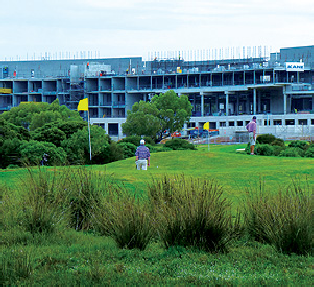 The RACV Golf Club redevelopment has reared its five-storey head, with a number of parties expressing a helpless outrage at the size of the development and the chunk of view it’s obscuring, both of the ocean and of the sky. Surf Coast Shire mayor, Councillor Dean Webster, said the council’s position to reject and oppose a fifth storey on the building has been vindicated as the addition of the fifth storey in construction last week has made the development intrude significantly into the sky. “Council was right to resist the fifth storey on the grounds of extreme intrusion into the skyline,” he said. “We’re very disappointed that VCAT didn’t acknowledge Council’s position and it’s clear that many members of the community have expressed disappointment at the decision and how the building is taking shape. “VCAT disagreed with our position that 19.6 metres was too high for the building. In short they said that because the two surf clubs protrude into the skyline it doesn’t matter if the golf club development does too. Federal MP Darren Cheeseman holds some strong views about the development, saying the people of Torquay are owed an explanation by the president of VCAT over how the RACV building was allowed. “I have written to Justice Iain Ross, the president of VCAT, asking him to personally visit the site to see what VCAT have done and to explain how this could ever be justified,” he said. “The first view (tourists) get of the Great Ocean Road is of a monstrosity that is a cross between a Soviet era tower block and some of the architecture on the prison island of Alcatraz. Justice Ian Ross said that he hadn’t received any correspondence on the matter and that he had no authority to intervene in a tribunal decision. “There is an appeal provision in the VCAT Act and that’s the appropriate course of action,” he said. Doug Clifford, who owns a house in Great Ocean Views Estate (GOVE), said that VCAT’s approval of the RACV development had created a measure of distrust in residents. Mr Clifford, who is lodging an objection at VCAT about a motel development in the Great Ocean Views Estate, asked how the RACV development got approved. “This has taken a large section of the sea views from all houses in the GOVE,” he said. Mr Clifford said that when the initial planning application was made to develop the golf club he and other residents didn’t think much of it. Torquay Golf Club member Greg Giampicollo said that whilst he felt for the people who had lost their views, some of whom were friends of his, overall the development was good for Torquay. “I’ll be honest when they got the extra rooms I thought it was a bit over the top,” he said. “I feel sorry for the people who’ve lost their views but the good side about it is that it’ll get people working, create jobs. The bit I don’t understand is as a soon as we (the members) voted on it and it went through they doubled the amount of units in the building.